Suzanne prepares to hand feed Sonya. Her bandaged leg is clearly visible. Photograph by Jan Lewandrowski. The collision occurred during evening rush hour between a red SUV and a bird that was “definitely NOT a pigeon.” Josh cringed as he saw the bird drop on the road, almost getting run over several times. He knew he had to do something quickly if the bird was to be saved. Risking his own safety and the wrath of his fellow commuters, Josh pulled over, jumped out, and stopped traffic. He flushed the bird off the road and onto a grassy area. Then, grabbing an old towel out of his car, he scooped the bird up. Now that Josh could examine the bird up close he saw she was a raptor. He had warned me over the phone that the bird’s leg was pretty bad, and as soon as I arrived I could see he was right. 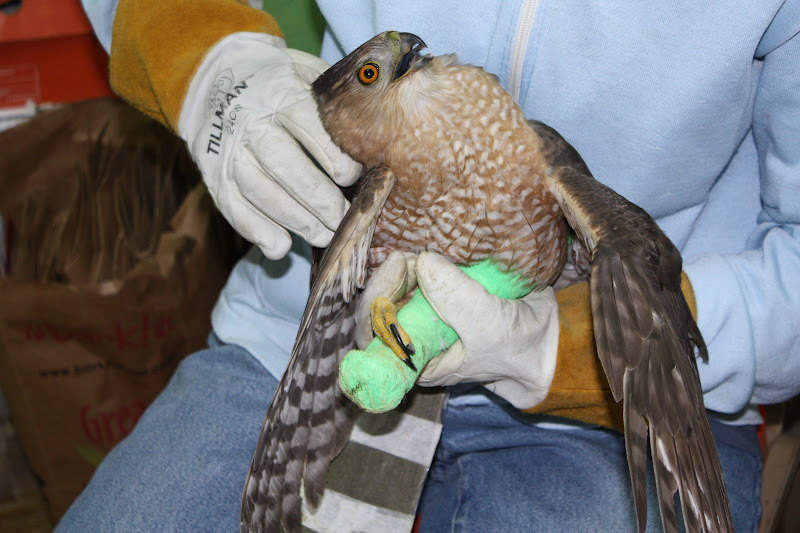 “Sonya,” as he named her, turned out to be an adult female Cooper’s hawk. Examination and X-rays later confirmed that she has a compound fracture of the tibiotarsus and fibula of her left leg, and severe bruising over her breast and abdomen. The bone is in three pieces, but fortunately (in part because she was rescued immediately after the accident), the skin remained intact. As soon as I got her back to Owl Moon Raptor Center, I splinted the fractured leg by surrounding it in a length of foam pipe insulation, and then wrapping that snugly in place with vetwrap. I also treated her with fluids and a good dose of pain medication. Friday morning I called Opossum Pike Vet Clinic (OPVC) and arranged to drop Sonya off for x-rays and possible surgery. I was not at all sure that surgery would be an option, and had braced myself (and Josh) for the worst. 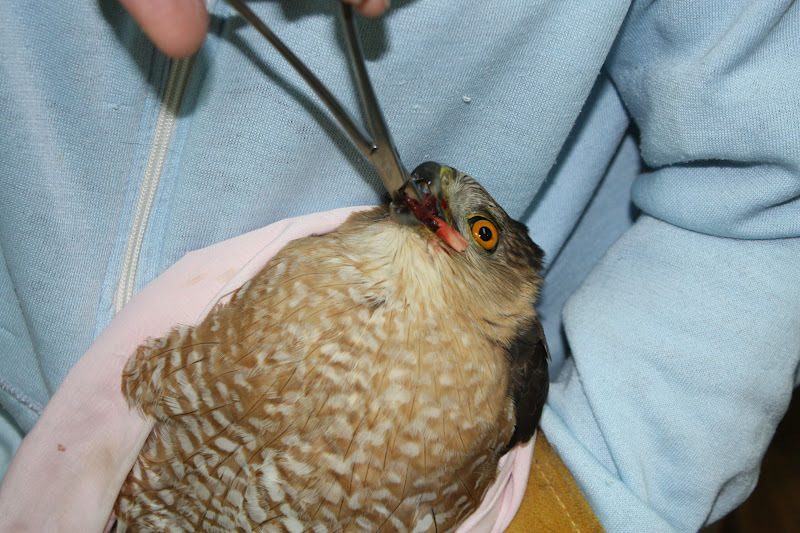 As I’ve mentioned in previous posts, Cooper’s hawks are rarely of suitable temperament for life in captivity. If Sonya’s leg had been irreparable, Dr. Barb and I would likely have chosen to humanely end her suffering. Fortunately, after looking at the radiographs, Dr. Barb determined it was worth a try. She went ahead with surgery, placing a pin through all three fragments, and setting the pieces in near-perfect alignment. With bird’s legs, however, alignment is only half the battle. Their spindly bones have a tendency to rotate around pins, so Barb added external support in the form of a moldable splint and leg wrap. I am grateful to Dr. Barb and OPVC for providing these services pro bono. Sonya is now recuperating back at Owl Moon, receiving regular doses of a pain medication, anti-inflammatory drug, antibiotic, and fluids. We cannot be sure that she will recover to the point of being able to hunt and survive the rigors of life in the wild, but we have hope. Sonya has a strong spirit of survival which she demonstrates in her response to handling; instantaneously meeting the offending hand with an adroitly placed talon strike of her healthy right leg! Suzanne feeds Sonya by hand. Photograph by Jan Lewandrowski. 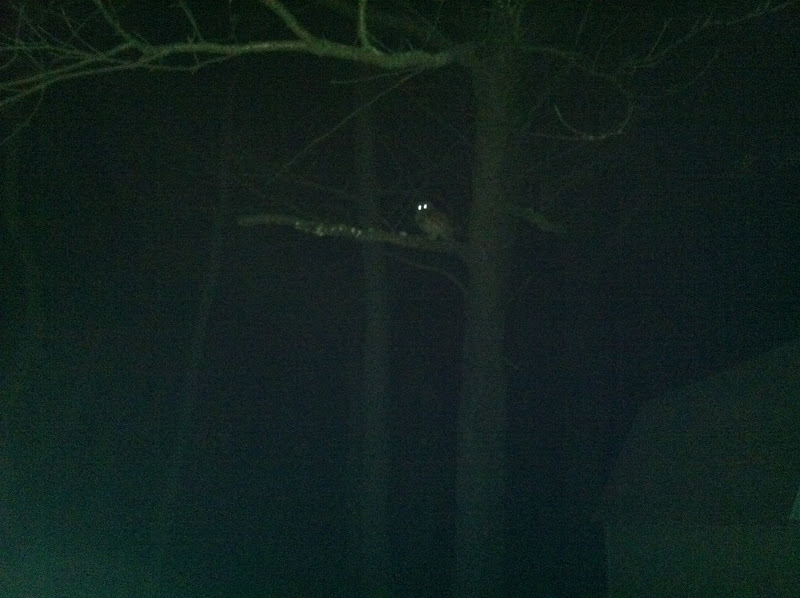 In other Owl Moon news, the two beautiful barred owls, Mystery and Cheerio, were set free in their respective woodlands on the evening of Sunday, February 12th. Cheerio, who I learned is a juvenile, was first. My friend and volunteer assistant, Lee Prouty, and I took her home to Petersville, MD, where we met Gary, her rescuer, at a barn along his driveway at dusk. I placed Cheerio on a post and she sat there watching us for a minute or two before realizing she was free to go. Next we drove Mystery to her home in Monrovia, MD where we met Daniel and Patti, who rescued her, as well as their daughter and a friend. She flew into a nearby tree to gain her bearings, and then continued on toward a distant line of trees and out of sight. 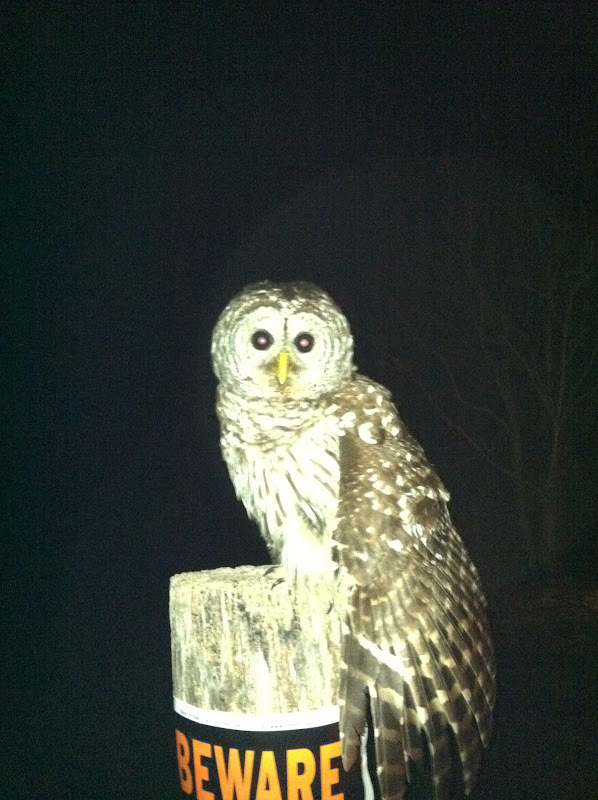 Cheerio sits on a post after her release. She doesn't seem to realize she is free to go. Photograph by Suzanne Shoemaker. Mystery looks truely mysterious back in her woodland home at night. Photograph by Suzanne Shoemaker. The release of the barred owls vacated one of my mews, allowing me to separate Squeak-toy from Soldier-girl and Rufus, the other two red-shouldered hawks. Because Squeak-toy cannot be released, I need to prepare him for life as an education bird. That means getting him used to handling so that he will be comfortable in front of groups for education programs. A relaxed bird is easier to work with, and therefore easier to place in a good program. Squeak-toy has a good start. He is young, and his treatments and physical therapy required a lot of handling, so he is already comfortable being touched by people. He is also handsome, and other than the disability his coracoid fracture left him with, he is a healthy bird. Having him in a mew by himself makes it easier for Squeak-toy and I to work together as we prepare him for a new life. Feb. 23 Addendum: Exciting news! Squeak-toy had some visitors yesterday, Denise and Jeremy from Hawk Mountain Sanctuary in Kempton, PA. They were looking for a medium-sized hawk for their education programs. Today I heard back from Denise and Squeak-toy convinced them that he is their guy! They will begin right away to prepare the necessary paperwork, and pending approval from the US Fish and Wildlife Service, the transfer will take place in early April. I cannot imagine a better home for Squeak-toy! 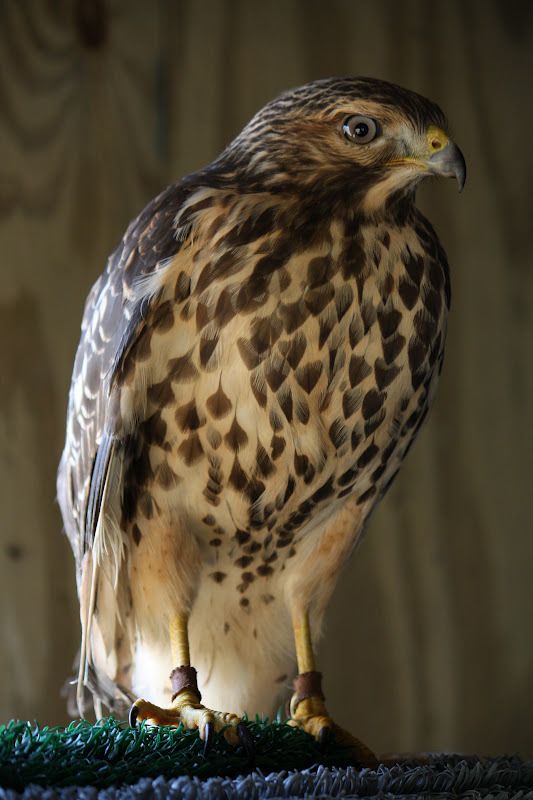 Hawk Mountain is a highly respected center for raptor research, education, and conservation. It is also a great place to watch hawks during the fall migration, when thousands pass over the mountain lookout on their way south. Learn more about Squeak-toy’s new home at http://www.hawkmountain.org! Hey Suzanne! Wonderful save, as always. I am certain Sonya is capable of survival. I believe sometimes we humans expect so much of our wildlife friends that nothing short of perfection is suitable for a satisfactory release, but in truth they are very capable of survival even with minor injuries. Peace. Ann, Thank you for reposting my blog, and congratulations on your nomination for a blog on fire award! I enjoyed your website photos and stories. Nicely done!